There are number of offices where people have to wear suits. The most prominent of suit colors that govern the office environment are charcoal grey and navy blue. When one compares the colors of suits men own, one of them is mostly navy blue. Men feel that grey has a less challenge as it goes with most of the colors. A Navy Blue Dress Shirt For Men also has the same importance or impression that a suit has on the crowd. It's vital to differentiate navy blue from other shades of blue. It's like deep midnight color and not dark blue. The shade of dark blue also has uniqueness, but the impression that is created universally by navy blue dress shirt is lacking there. The dark shirt could be worn for any occasion, clubbed with a light suit. In the level of formality, it serves like the substitute of a black tie. It can also be worn to lighter ceremonies like social gathering. Pinstripes navy blue dress shirt is also considered to be a business wear. It creates a strong impact. It clearly gives the message to the person in front the individual, that he is ready to sign the deal. He is here to stay and business done with him would always be fruitful. It's advised that one should not take a glossy navy blue dress shirt. This is for the simple reason that it creates an unnatural look. The fabric does not look as appealing to the eyes as it should be. While buying a navy blue dress shirt, keep in mind that the color is a spread color rather than the normal one. They look more formal than the normal ones. Always consider to buy a two ply shirt rather than a single ply. This is because the fabric of a two ply shirt would be softer and stronger. It's also vital for you to check the fitting of the navy blue dress shirt, before its' bought. The shirt's sleeve should be long enough so that once you stretch your arms, it does not ride up. When arms are moved the sleeves should be in place. The cuffs should also be in place in the shirt. One should try the shirt to ensure that the cuff needs to be opened before wearing it. The shirts button should also be properly in place without any gapping. If gapping is there, then the shirt is tight for you. A larger size of shirt is required then. If it's tight on the chest, it indicated that a larger size of Navy Blue Dress Shirt For Men is required. Round the neck men sweat a lot. Thus it's important that they get proper room to breathe round the neck. To check if the navy blue dress shirt is ideal for them or not, they should move two to three fingers between the collar and the neck. 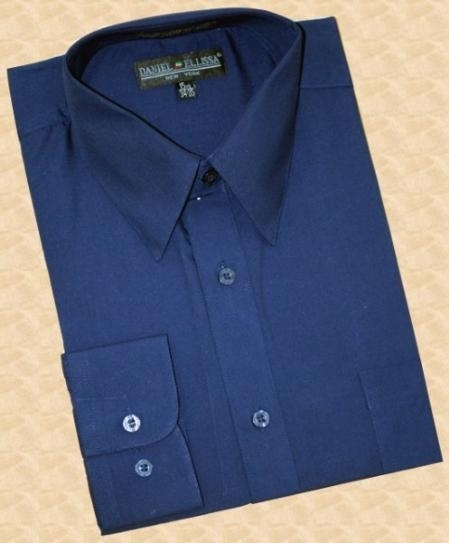 If there is proper space between them, then it is the ideal navy blue dress shirt for them.